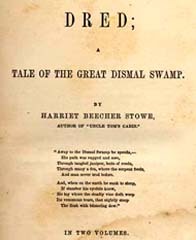 Harriet Beecher Stowe, 1811-1896 Dred; A Tale of the Great Dismal Swamp. In Two Volumes. Vol. I.
Dred; A Tale of the Great Dismal Swamp. In Two Volumes. Vol. I.
Boston: Phillips, Sampson and Co., 1856. Dialect literature, American -- North Carolina. Dismal Swamp (N.C. and Va.) -- Fiction. Slavery -- North Carolina -- Fiction. Slavery -- United States -- Fiction.